Yes, unfortunately there's just no way of getting around that travesty you're all thinking of. However unfair it might be to the developers at Creative Assembly it's impossible to not bring up Aliens: Colonial Marines. While the industry certainly sees a fair share of bad releases every year, Aliens: Colonial Marines was a bit of a rarity. A high profile title made all the more well-known by its critical panning, of which at least some could be attributed to a feeling of betrayal from such a beloved franchise. If Colonial Marine had simply been some generic space marines versus aliens, it probably wouldn't have been as noteworthy. It is refreshing then that the developers at Creative Assembly are so devoted to "making the Alien game we always wanted to play". 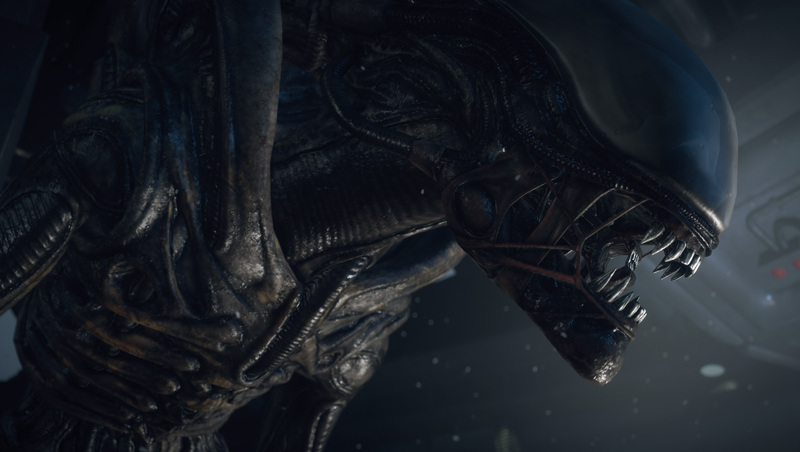 It might initially seem off for a developer known for their PC strategy games to be making a survival horror on consoles as well no less, but Alien Isolation is a new team at Creative Assembly, separate from the Total War folks, that's been selected and poached from industry veterans. Every aspect of the experience is grounded in the themes, design and aesthetics of the Scott's sci-fi film. The devs were really excited to finally show off what they've been working on in extended secrecy, no surprise given Colonial Marine's reception. Even our preview was handled a bit differently perhaps in response as well, as we were intentionally left in the dark and no shown trailers or images of the game. Our first experience was playing the game, and based on my brief time with it, the folks at Creative Assembly are absolutely nailing the correct feel for this game. It still remains to be seen how a few mechanics will pan out, and if the alien proves an interesting foe with repeated encounters, but I think there's no denying this is the closest we've gotten to an authentic Alien game. The game's story picks up 15 years after first film. The Nostromo's flight recorder was recovered, after Ripley blew the ship up, and has been brought to a past-its-prime space station out on the fringe of human expansion. You play as Amanda Ripley, Ellen Ripley's daughter, who is still wondering what happened to her mother. Amanda and a team from the series' mega corporation Weyland Yutani travel to the station to retrieve the flight recorder and get some answers. The section we played was near the middle of the game, so the reveal of how a xenomorph got on the station is still a mystery. The core gameplay is pretty straightforward. 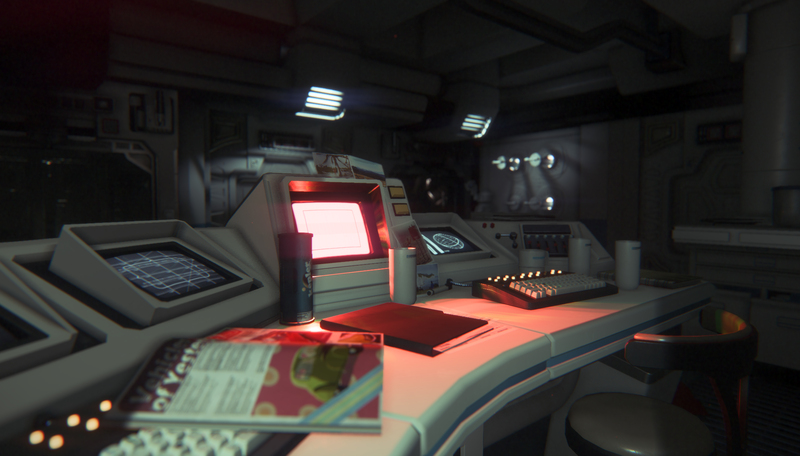 You explore the station in the first person, with a noticeable lack of any UI elements. Your tools are just that, tools not weapons. You've got a flashlight, motion tracker and a few other things you pick up along the way like a spot welder. There are crafting components scattered across the station for those diligent enough to collect them, though the final details of those mechanics are still in the works. We didn't get to see what could be made, but from speaking with the devs it sounds like the current plan was you'd be able to make various useful and consumable devices such as ways to distract the alien. The motion tracker is your primary tool and works much the same way as seen in the films. However, this time around the motion tracker isn't simply taking over the on-screen mini-map. It's an item bound to the trigger that pulls it up into view. There's even this great dual nature to it, in that it both obscures a good deal of your view and the depth of field changes to blur out the background a little. So you must weigh the advantages of being able to see clearly or have a pin point location on the tracker. The UI of the tracker supports and enhances the gameplay the most when the alien shows up. After cutting open a door and hacking a console, the alien crawls out of the ducts and begins hunting in the area for you. Rather than being pre-programmed to follow some kind of set patrol pattern, the alien is completely sense driven. The developers gave us a glimpse of the alien's AI flow chart and the massive jumble detailed how it smoothly transitions from stalking and investigating to attacking. 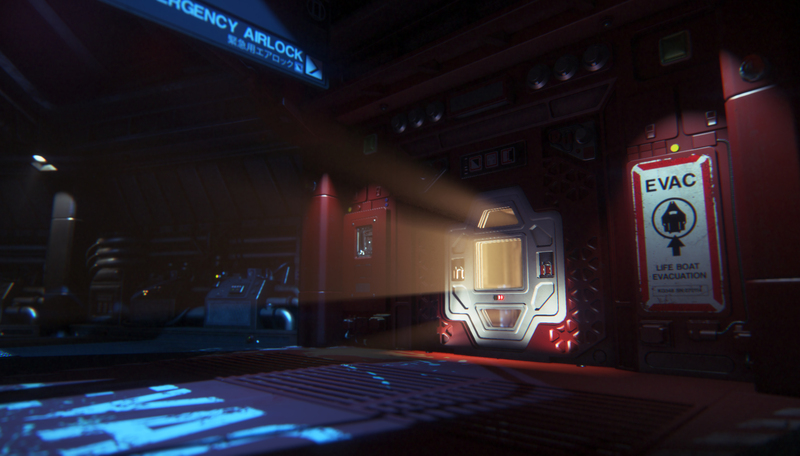 According to the developers, it was important to implement the alien this way since it makes every encounter unique and ensures the alien behaves believably on screen for extended periods of time, as opposed to the 15 seconds that most enemies last in other games. 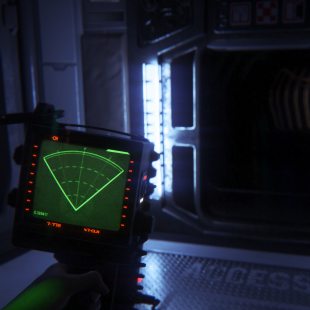 You need to avoid being seen or heard to survive, which of course the game makes difficult by making your objective to open a well-lit airlock door. I loved these great naturally occurring moments of gameplay where you duck into a locker to avoid being spotted, and the xenomorph comes right up to the vent searching for you. 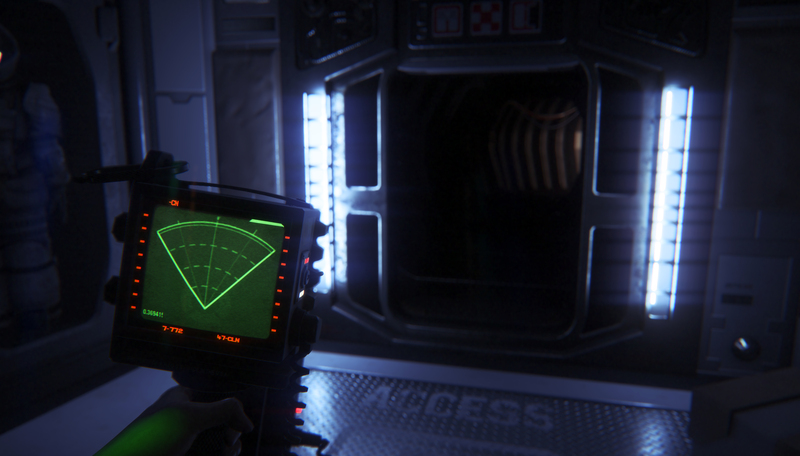 You're even prompted to push back away from the locker door and hold your breath in game, which may even catch you holding your breath for real as the alien looms inches away. Or maybe you know the alien is behind you, and you try and make a mad dash for the escape hatch, hearing it screech and tear after you just steps behind. I still want to see how well it holds up after you've repeatedly encountered it throughout the course of the whole game, but the alien is supposedly able learn and if you repeatedly use the same methods it will adapt to them. 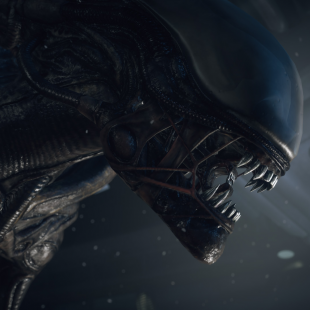 Undeniably, the "character" of the xenomorph and even the setting itself are considered paramount for the developers at Creative Assembly. The dedication into crafting some of these elements was simply staggering. The alien achieves its fluidity of motion through layers of animations being blended on top of each other, so it can be smoothly ramped up as it responds. Players will even be able to recognize when it transitions from stalking the area to keying into investigate something specific based only on how it moves and sounds. Equal love was given to the space station in order to make it feel like it existed in the Alien universe. The approach was to give everything a low-fi version of the future, where the technology is certainly advanced but, frankly, a bit crap. Some of the areas look as if they've been pulled straight from the Nostromo, and in part this was achieved through implementing a simple rule. If a prop couldn't have been made in 1979, when the film was made, it didn't make it into the game. One dev even shared a humorous story about how the best way to create that analog feel for all the in game screens was to actually record to VHS and then record back over while messing with the cables and running magnets over it. Two TVs were destroyed during the making of the game. It's this wonderful, and slavish, attention to detail that really makes the whole experience work. The look, feel and sound of the game all scream Alien. 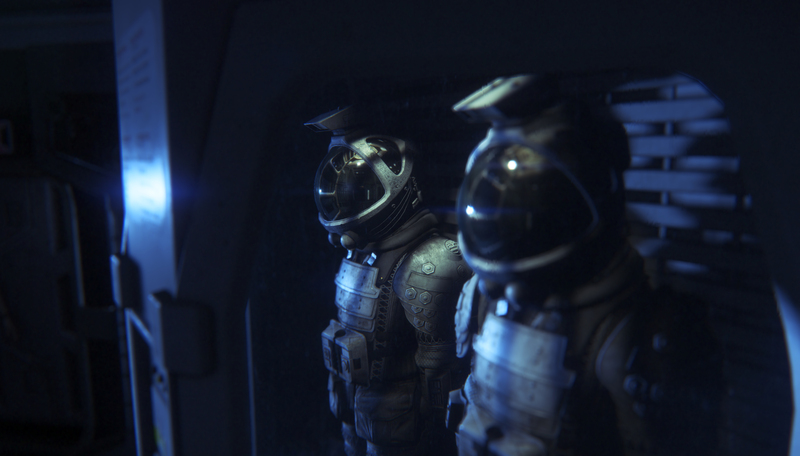 Look for Alien Isolation later this year on the PS4, Xbox One and PC. It might just be good enough to wash the terrible memory of Colonial Marines out of our collective consciousness forever.